If you want to improve the air quality within your home or just need to remove unwanted smells such as smoke then an air purifier could be the thing for you. Price and features vary between different models and brands so what are the best ways to choose the ideal air purifier for you? We have put together this guide by researching the air purification market and choosing the best air purifier based on value for money, features, sales and online reviews. We also list other models that may be worth some consideration depending on your requirements and budget. At the end of this guide, there is also a handy checklist of what to look for when buying an air purifier. 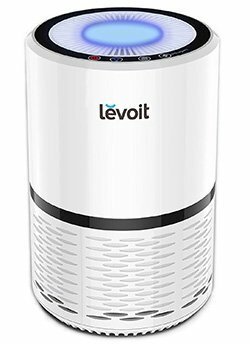 The Levoit is a feature-packed, well-designed air purifier so it’s easy to see why its one of the best selling models available. It’s not the cheapest at around £60-£70 but we feel it’s worth paying that bit extra for the performance and quality. Although the brand name might not be instantly recognisable, Levoit is a US-based company that specialises in air purifiers, salt lamps and humidifiers. As you would expect at this higher price point, the Levoit has a three-stage filtration system that draws the air across a fine preliminary filter, a True HEPA filter and finally an activated carbon filter. If you’re wondering what a “True HEPA” filter is then its a HEPA (High Efficiency Particulate Air) filter that can remove 99.97% of particles that can be as small as 0.3 microns, whereas as “standard” HEPA filter can filter 99% of particles that are 2 microns or larger. The activated carbon filters are the ones that reduce odours as the carbon has a large surface area that can absorb and remove contaminants and impurities from the air. A full replacement set of all 3 filters for this model is available for around £20. This model has three fan speed settings allowing you to choose between extraction rate and noise level. The fan is not excessively noisy in use but you’ll probably want to keep it on the lowest speed setting if you are using the unit in your bedroom overnight. The Levoit is a relatively small unit (although not compact) measuring 32cm high and 19cm in diameter (around 12.6″ x 7.5″). What we do like is the design, which instantly reminded us of an Amazon Echo Plus. On top of the unit are the simple controls including fan speed. There is also a button for the blue night light. A couple more noteworthy features are the 2-year warranty and the fact that unit is supplied with a mains power cable, rather than a USB cable that can be found on some smaller and cheaper models. The Levoit is also ozone free as it does not use UV-C light or have an ion generator. The flow rate (Clean Air Delivery Rate) is also impressive at 68 cubic metres per hour, which is more than enough for large rooms in your house. 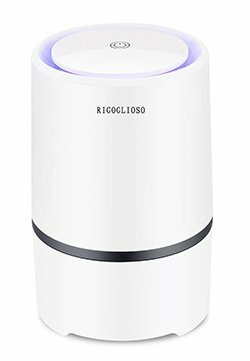 In summary, this is the air purifier we would recommend as the best one. Yes, it’s not the cheapest but the features, quality and performance help to justify the price tag. Rigoglioso – not a brand name we are familiar with and a search online reveals nothing either. They are in fact a Chinese company that sells a couple of electrical products on Amazon. Although the RRP is similar to the Levoit, the offer price is usually up to 40% off this, making it significantly cheaper than the Levoit. Design-wise, it’s a similar appearance to the Levoit but smaller at 20cm in height and 12.5cm in diameter. This air purifier does have a True HEPA filter and activated carbon filter with replacements available separately. There are no fan speed settings on this unit and the single top-mounted button is slightly confusing. Pressing it once turns the unit on but pressing twice puts it into sleep mode which reduced the brightness of the built-in light and turns the unit off after 8 hours. There is no option to completely turn the light off though. Power is provided by a USB data cable which is supplied, but you’ll have to find something to plug this into, such as a phone charger plug. Noise levels are low but this is most likely down to the lower power of this unit. This air purifier does a decent job of removing odours but you can clearly see why it costs less than the Levoit. 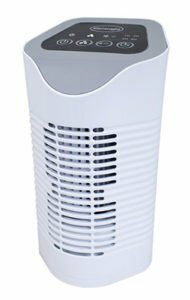 Overall, a decent budget air purifier for use in smaller rooms. Yes, this is the same Silentnight that makes bed and mattresses and the 38060 air purifier fits with the company’s aim of giving you a good night’s sleep. This model is another 3 stage air purifier that uses a fine gauge filter sponge, HEPA filter and activated carbon filter. A set of replacements filters are available. While we don’t think it looks as good as the Levoit (or Purus) it more than makes up for that in features. As with the Levoit there are 3 fan speed settings but the Silentnight also includes a timer with preset shut-off times of 1, 2, 4 or 8 hours, making it ideal for using in bedrooms when sleeping or to purify a room when you are away from the house. This model also features an ionizer and this can be switched off if anyone is concerned about ozone generation. Noise levels are relatively low (think low-speed fan noise) but can increase on the higher speed settings. The Silentnight 38060 is around the same price as the Rigoglioso but in our view offers better performance and more features. It really comes down to whether you prefer the style (and more compact dimensions) of the Rigoglioso. 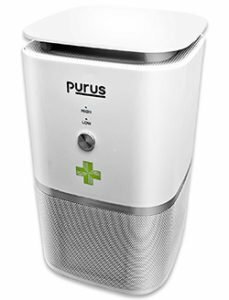 The Purus is a very stylish air purifier that reminded us of a Sonos speaker with its grey coloured air grilles. Again this is a 3-stage air purifier that features a True HEPA filter and charcoal filtration. Although the filter should last for 12 months and is removable we could not find any replacement parts online at the time of writing. The Purus is slightly less expensive and marginally smaller than the Levoit. It features two fan speed settings but does without a light or timer function. Airflow rate is impressive though at 50 cubic meters per hour (the Levoit is higher a 68) making it ideal for use in large rooms. This model also comes with a 2-year guarantee. In summary, the Purus has similar performance to the Levoit (although does not have the light or extra fan speed) and will look stylish in any room in your home. Filtration system: Ideally you want to be looking at a three-stage system that has a fine preliminary filter, a True HEPA filter (that can remove 99.97% of small particles) and an activated carbon filter for removing odours. Also, make sure that the filters can be removed and replacements are available (and that they’re not too expensive – around £10 is a reasonable price). Here is a good resource for further reading on HEPA filters. Fan speeds (and noise): Different fan speeds allow you to adjust the settings to the individual room requirements. They also allow you to put the fan on a quieter setting for use in bedrooms. The maximum number of speeds you’ll find is normally 3. Filtration rate: For large rooms, you’re going to need an air purifier with higher airflow (measured in cubic metres per hour), such as the Levoit or Purus. Size: Look for a more compact unit if you plan to use on a bedside cabinet. You’ll find most air purifiers are relatively small appliances. Additional features: Some air purifier models have useful additional features such as timers and lights (just make sure you can switch the light off). More info: Check out our reviews of Dyson and Vax air purifier ranges.